I originally wrote the Excel add-in that converts Excel files to MySQL while a student at Georgia Tech as a Visual Basic macro. Over the last nine (9) years it has been used by hundreds of customers in many industries, including by many small businesses, several publicly traded companies, government agencies, and educational institutions. The current version is still a macro that works fine with Microsoft Excel for Windows, but it is time to build a solution that works for more platforms, including my personally preferred Mac OS X and Linux systems. To this end, we are currently working on a web-based service to provide cloud-based spreadsheet to database conversions. However, the first step towards deploying the new service is migrating the current infrastructure to Ruby on Rails. The original sqlconverter.com website was written in PHP and hosted on a typical shared Linux server environment, but the new one is entirely in Ruby on Rails 3.1. We setup the routing such that the old URL structure was maintained for search engine optimization (SEO) purposes. We also implemented canonical links to avoid duplicate content penalties due to the pages being accessed through more than one path. One of these days I should write a bit more about the tricks employed. 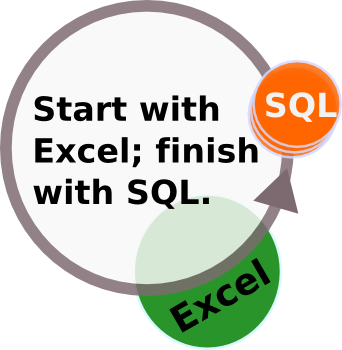 If you routinely work with spreadsheets provided by customers or team members and need to get that data into a MySQL database for your projects, please check SQL Converter out. Also please feel free to let me know if you have any questions about it!